As I have read through many of the various threads on Superdenim something which has interested me is the idea of comparing the heavier models made by various manufacturers, in terms of fade and durability. 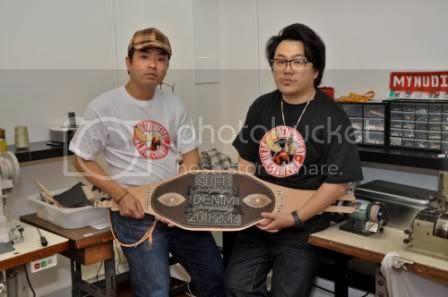 Obviously there are brands like Samurai and Iron Heart who we all know make some great, heavy cuts, but there are also the new DB x SF x SE x SF jeans, aswell as the new SDA's at BIG. Ideally, I'd like to see some of the newer( (like me), or perhaps less frequent posters come into play here, us guys who haven't done any other competitions yet. Aswell as some of the more seasoned members to get a good mix of styles and wearing. This seems like a good time to get a competition like this off the ground too, I have read that alot of you guys are looking for your next purchase/ project denim, as am I, so this could be fun. 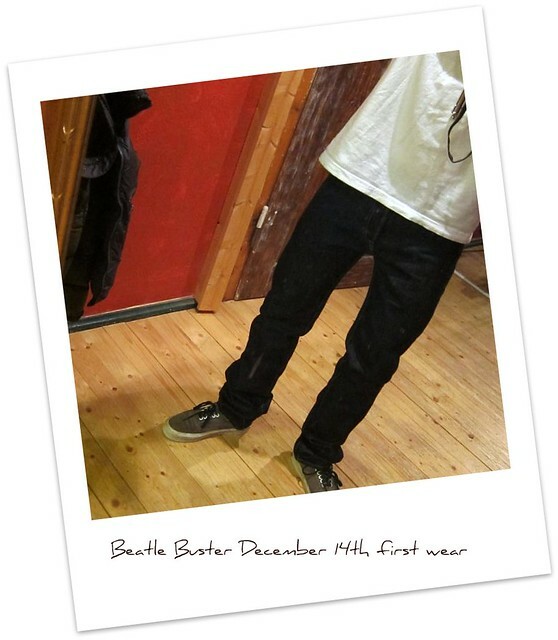 The basic idea is this, a 24 month competition in wearing and abusing some heavyweight denim, 17oz and above. From here on in the contest will be open to all comers, as i originally intended, the following stipulations still apply. 1) Denim must weigh over 17oz. 2) Denim must not have been worn prior to 01/12/10. 3) Closing date for entry will be 01/02/11, you must have at least ordered your chosen denim by then. 4) We expect an update every month from ALL participants, two months without an update will be considered MIA and you will be removed from the contest (without good reason for not updating obviously). 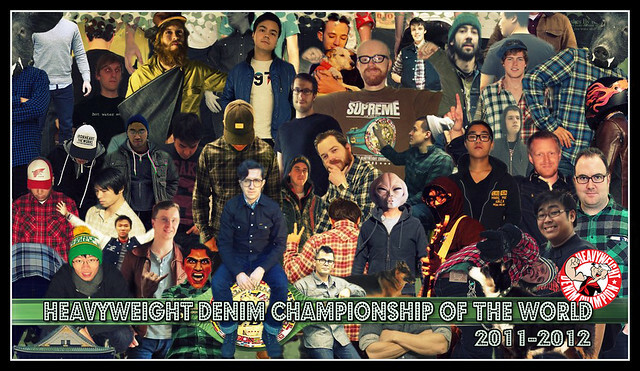 5) If you are already in a different competition wearing heavy denim, feel free to cross compete in this aswell, the more the merrier. I think that this could be alot of fun for all involved, PM me if you are interested in signing up. The shape will be as wat you have shown me in pics, boxing champion style. The front part will be 8" diameter, curve down to the back 4" width. On this 4" width, we will separate it into 1" double strap for buckle securing. The whole belt will be made of Natural Veg Tan leather (yet to confirm the thickness). But on the front part, we will stitch up a round Black Natural Veg Tan leather. 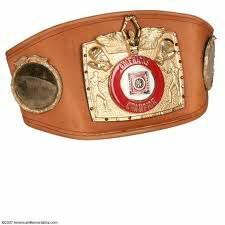 On this Black round leather, the wordings, "SUFU HEAVYWEIGHT CHAMPIONSHIP' will be formed by silver dome rivets around the circumference. And in the middle, the wordings 'DENIM". We will also add some conchos to spice up the belt a little. I think that sounds unbelievable personally, and I'm so stoked that James could help us out in this way. Donations are no longer required, the belt has been paid for. I'd like to thank obbigood for this amazing support and help. THE RAJA BELT IS HERE !!!!!!! I present to you the 'BELT RAJA', the king of belt! This is wat we call it. - 15oz Natural Veg Tan leather as base. - Stone oiled distress leather and black burnished leather for lettering. - Added hair-on-hide, stitched on. 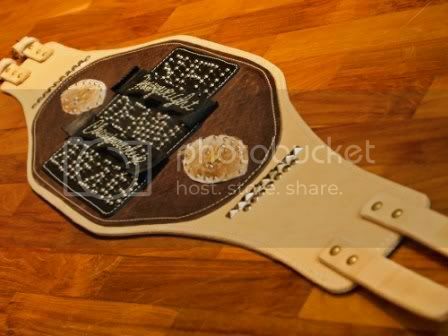 - Hand-stitched 'Heavy Weight Championship' in cursive font. The following prizes have been generously donated by Selfedge for the competition. Another huge thanks to Kiya and Self Edge for this amazing support. 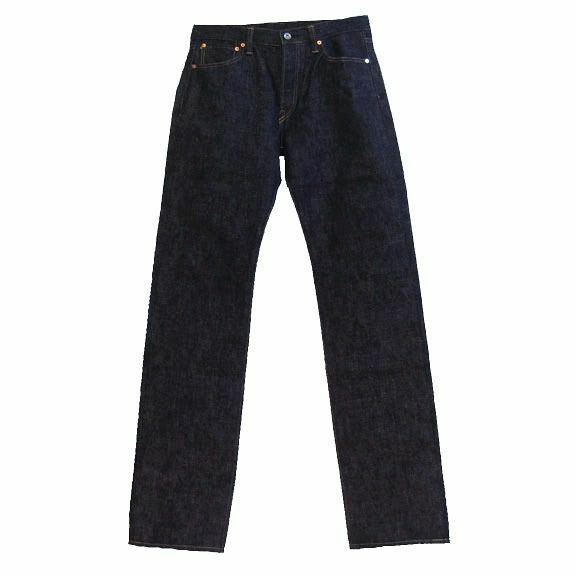 26) saintkeat - Iron Heart 666 - 18oz No longer in the contest. 5 MORE DAYS TO ORDER A BANNER. IF YOU WANT ONE PLEASE ORDER THIS WEEK BECAUSE IT WILL BE HARD TO ORDER MORE LATER (NOT IMPOSSIBLE THOUGH). I'LL RE-POST THESE LINKS ON EACH NEW PAGE UNTIL SALE IS OVER. here is a link to what's left if anyone still wants one. If you don't see the color and size you want then it's SOLD OUT! As of now there is at least one in every size and color. you can now order your banner here. 18" x 12" - 24" x 36" - 30" x 48"
Let me know if you have any problem with the order page. PLEASE POST PICS WHEN YOU GET YOURS!! as you mentioned, people involved in another competition are also welcome, than I ask kindly if I am allowed to join. Of course you can b_F, great to have you onboard. wish this would have had a bit more advanced warning.. got about 5 days of wear in my IH. Oh well.. good luck guys, this should be fun! I only thought of it last night man, but I'm pretty sure the rules could be bent for the sake of 5 days if you're really interested. Unless you've been climbing mountains or something in the last few days I cant see what difference a few days would make over a 24 month contest. You want me to add you? same opinion. 5 days in 2 years is nothing. as the S500JX-LR is only running one year it would be nice if this contests motivates me to wear them 2 years straight. Awesome. Its started for those who have their jeans, I'm just waiting for an answer back from Gordon at BIG about shrinkage on the 21oz denim, then I can pay for mine. I'm going to be another couple of weeks before I step in the game.....but over 24 months, y'know the rest. what jeans are you thinking of getting Megatron? 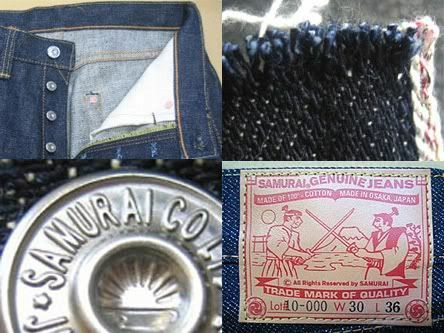 The S5000VX 21oz, I'm really intrigued by Samurai's "cloth of excellence", ha ha. I would just like to say thanks for being allowed to join and hope everybody is okay with it! edit: Beats just do a duel entry with your indigo Busters and sbg Busters.. you know you wanna! seriously though, that SDA pair does look amazing. wish i was in: An Evisu store, Japan. Awesome, i havent got anything heavyweight yet but i will certainly be keeping up with this thread if it is updated regularly!! Great mix of denim in the competitors so far, especially if Beats can be talking into throwing the Busters into the mix. ^i already contacted some stores for measurements and size advice....maybe iÂ´ll be the one. Jeans have to be brand new, basically purchased after 2010, right ? or can I play with these ? You can play with those Beats, welcome to the Heavyweight Championship. First fit pics of my S500JX-LR after two warm soaks (last one was more a handwash). Still a bit damp on those pics. I want to join in with my 21oz double volantes that I bought a few weeks back! Am I good to go with the contest? I'll post pics regularly! 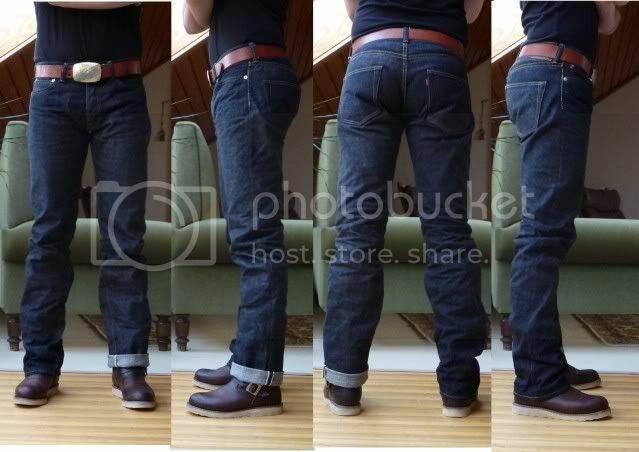 I do have pics In both the waywt-thread and the "so I'm having a pair of jeans made"-thread. I've worn these maybe 4 days a week since I bought them and have done o e initial one hour soak on them. Please be kind to me! To let you know some more about me, I'm 29 years old turning 30 in July and I live in Sweden. Where heavyweight denim is to prefer since it's winter here a loooong time.